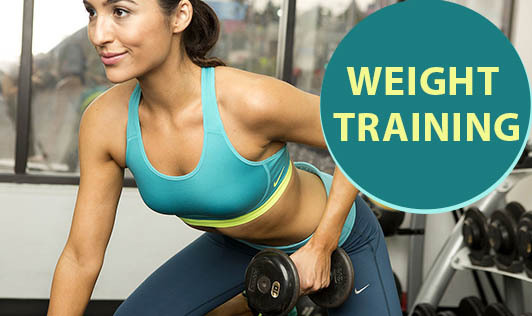 Weight training is a common type of strength training for developing the strength and size of skeletal muscles. It uses the force of gravity (in the form of weighted bars, dumbbells or weight stacks) to oppose the force generated by muscle through concentric or eccentric contraction. Increases HDL - (good cholesterol) and decrease LDL - (bad cholesterol). Increased muscle strength, power, endurance and size with enhanced performance of everyday tasks. Boosts metabolism (which means burning more calories when at rest) while reducing body fat. Your overall weight may not change, but you will gain muscle and lose fat. Over time we can notice decreases in waist measurements and body fat measurement. The way you sit and stand are influenced by the health of a network of neck, shoulder, back, hip and abdominal muscles. Stronger muscles can help you stand and sit straighter and more comfortably. One can notice improved balance and stability. As you begin to notice the positive physical changes in your body and develop a regular exercise routine, your ability to handle stress effectively will improve. Weight training allows you to sleep better, i.e., fall asleep quicker and sleep deeper.